The Ash City – North End Men’s Excursion Concourse Performance Shirt is available in Sizes: S-5XL and comes in the following colors: Black, Crystal Blue, DK Oakmoss, Navy and Stone. This Men’s Excursion Concourse Performance Shirt also has moisture wicking performance and back vent system keep you feeling comfortable and fresh all day long. SKU: AB-87047 Categories: Activewear, Corporate Apparel, Men's Corporate Apparel, Men's Corporate Shirts, Woven Shirts, Woven Shirts, Men's Clothing, Shop by Color, Black, Blue, Navy Tags: men's clothing, woven shirts Brands: Ash City. 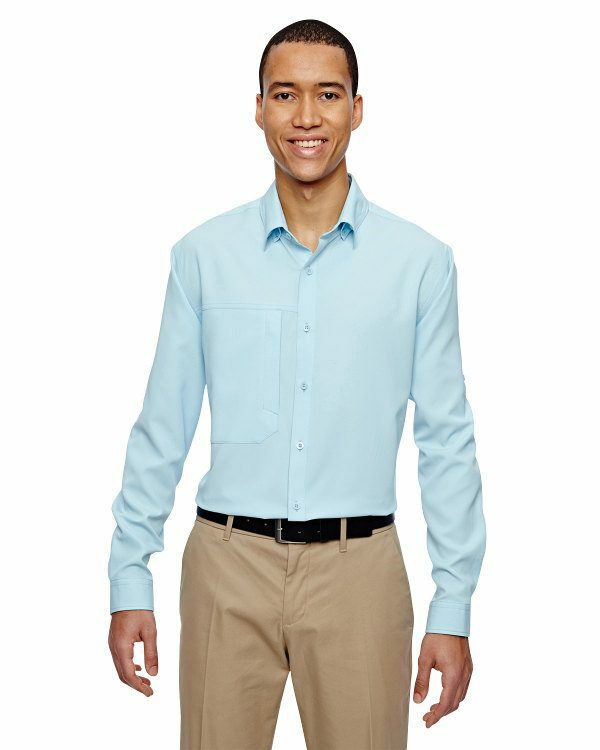 This full polyester dobby stripe Men’s Excursion Concourse Performance Shirt is featured with hidden button-down collar keeps you looking polished and professional all day and is suitable for corporate uniforms, service wear, hospitality, resort and travel wear. Our Men’s Excursion Concourse Performance Shirt also has moisture wicking performance and back vent system keep you feeling comfortable and fresh all day long.